Thom gets his own poster, courtesy M.A.C. Kingsley. Because new records have sound all over them, and you should probably get paid for that. Television itself (well, American TV — BBC is doing just fine) has ground to a halt over online revenues for writers. How are musicians doing? Not so well, say Radiohead. Ars Technica notes that Thom Yorke has been going around pointing out many labels screw artists out of digital download income in contracts. The solution isn’t rocket science: get a better contract, get a different label, or go it alone. Radiohead chose the “go it your own” approach, of course. But whatever benefits they got from, erm, being Radiohead, the one thing you have in common with them is that if you do the same, you can also get 100% or revenue instead of 0%. And you’d have to be pretty unpopular for that to be a bad deal. So much of the discussion of digital distribution issues is in broad terms, though, that last point could be missed. You have a choice: get screwed, or not. TuneCore, a service by which artists can be distributed on sites like iTunes Music Store, Amazon, and Rhapsody, recently reported that its customers have earned some $4 million through download sales alone. TuneCore charges only a flat fee for its service, and artists are biting, from Queens of the Stone Age to Public Enemy to Keith Richards. That’s not meant to be an ad for TuneCore; I think other services will step up to the plate, too, and TuneCore’s own revenues seem like only the tip of the iceberg. One concern in all of this is that, as long as iTunes Music Store is the primary outlet, Apple can fix prices (and its cut) in a way that benefits Apple, rather than anyone actually selling music. But even that concern may be fading, as services like Amazon’s excellent online store and niche-focused outlets gain traction. 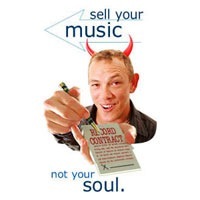 If you do want to go it on your own, there’s no reason you have to give away your music away, or call your album “In Rainbows”, or change your name to Tom Yorke. Got online distribution experiences you want to share? Let us know.